British church leaders have called on the Government to take in refugees driven from their homes in northern Iraq as the US began air strikes on the Islamic State (IS) militants whose actions the Iraqi parliament described as genocide. President Barack Obama also launched an airborne operation to deliver humanitarian aid to some of the more than 100,000 Christians and Yazidis who have fled and are without food or water in the mountainous desert region of Nineveh province. On Friday the Cardinal Archbishop of Westminster, Vincent Nichols, called on Britain to lead efforts to protect the displaced and ensure their access to humanitarian aid. The Archbishop of Canterbury, Justin Welby, said that "like France, the United Kingdom’s doors should be open to refugees, as they have been throughout history," he said. The Anglican Baghdad-based cleric, Canon Andrew White, said: "Britain must offer refuge to these people. The US, Sweden, Australia and Canada have all offered sanctuary to some Iraqi Christians." French Foreign Minister Laurent Fabius and Interior Minister Bernard Cazeneuve said last month that the country was ready to provide asylum to Iraqi refugees. Meanwhile Pope Francis has dispatched an personal envoy to Iraq. Cardinal Fernando Filoni, formerly a papal nuncio to the country, is to travel to Kurdistan to show the pope's "spiritual support and the church's solidarity with the people who are suffering", papal spokesman Fr Federico Lombardi said. "He is supremely qualified. He was the only diplomatic representative who stayed in Baghdad during the US-UK invasion," he added. The Vatican has been criticised by Eastern Christians for not doing more to help those forced from their homes by militants. Pope Francis has called for the international community to take action to protect and provide for those who are marooned in the mountains with little food or water. He tweeted today: "Please take a moment today to pray for al those who have been forced from their homes in Iraq." 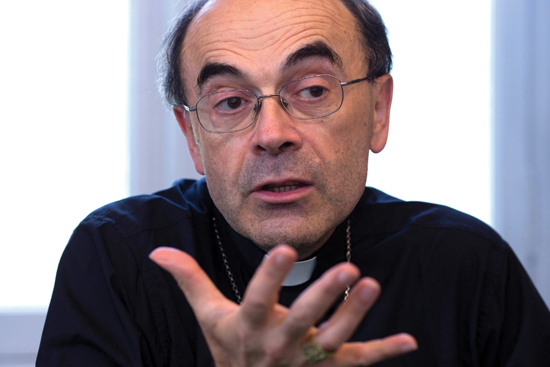 The head of the Italian bishops conference Cardinal Bagnasco said that the violence was a "wake-up call" from "the anesthesia of our daily lives" and a "reminder of the courage of witness". On Thursday jihadists took control of Qaraqosh, home to the largest remaining Christian community in Iraq since the fall of the city of Mosul in June. IS jihadists who have “chopped off heads, chopped children in half, hanged people on crosses” as they tore through northern Iraq, Mr White told The Times. UK Prime Minister David Cameron today backed Mr Obama’s decision to carry out airstrikes. A spokeswoman said that the Government was looking into ways to respond but ruled out military action. Pope Francis urgently called on the international community to take initiatives to put an end to the humanitarian drama underway, to protect those threatened by violence and to ensure the necessary aid for the thousands of displaced people. The Catholic peer Lord Alton said it was welcome – albeit “belatedly” – that Government's emergency response committee had met to discuss the situation and that the US had decided to air-drop aid. He said the international community had to give the Iraqi authorities and the Kurdish Peshmerga forces “every assistance” in stopping IS’s “genocidal” ambitions. Yesterday the Iraqi Parliament passed a resolution calling the actions of the Islamic State a genocide. In a resolution the Parliament declared 12 towns to be disaster areas and demanded the international community go after the militants and anyone financing them. 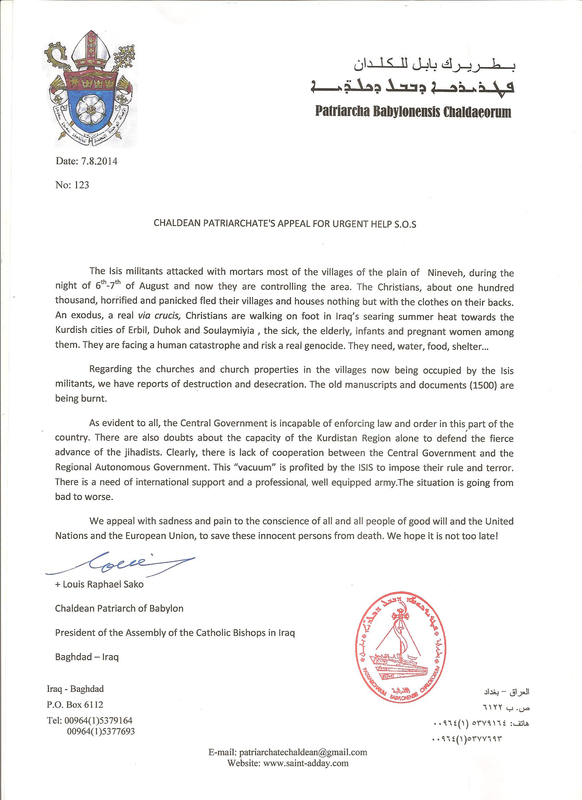 The same day Chaldean Patriarch Louis Sako of Baghdad issued a statement calling for “international support and a professional, well-equipped army” because the central Iraqi government is incapable of protecting its citizens and there is no cooperation or coordination with the regional government. He said around 100,000 Christians had fled their homes after the seizure of Qaraqosh “with nothing but the clothes on their backs". "Christians are walking on foot in Iraq's searing summer heat" toward Iraqi Kurdistan, among them "the sick, the elderly, infants and pregnant women." "They are facing a human catastrophe and risk a real genocide. They need water, food, shelter." Mr White described the desperate needs among refugees to whom his organisation is providing food and water. “People came with nothing but their clothes,” he said last night in a message to his supporters on Facebook. Militants captured Qaraqosh following the withdrawal of Kurdish Peshmerga troops who had been fighting off the militants’ advance, the BBC reported. The bishops of England and Wales have urged Catholics to pray specifically for Iraq at Masses this weekend. They also called on the British Government “to prioritise action to save the Christian and other persecuted communities of Iraq and to offer them the help and support they need urgently.” The Vatican has written to all the embassies accredited to the Holy See to urge the governments they represent to strive harder to resolve the crisis of conflict in Middle East. This week the Mr Fabius said Paris would ask the United Nations Security Council to condemn the Islamic State for the expulsions and ask the UN Human Rights Council “to investigate these crimes”. Speaking after meeting a church delegation on their return from northern Iraq, he stressed his Government’s determination to help religious minorities, and said he would visit Iraq soon to discuss the problem of Christian refugees with the Baghdad Government. Mr Fabius met Cardinal Philippe Barbarin, Bishop of Evry Michel Dubost – the head of the French bishops’ interfaith dialogue council – and Mgr Pascal Gollnisch – the head of the L’Oeuvre d’Orient charity supporting Middle East Christians – after their visit to Iraq to support persecuted Christians. On 30 July French President François Hollande stressed in a phone call to his newly elected Iraqi counterpart, Fouad Massoum “the urgent need to protect minorities”, including the Christians “persecuted by terrorist groups”. Having cleared the trip with Cardinal Parolin beforehand, Cardinal Barbarin and his two colleagues visited the Kurdish cities of Erbil and Qaraqosh, close to the front line with the Islamic State, which drove the Christians from Mosul. The three men said many Muslims had helped the Christians, and Muslim politicians in Kurdistan said they wanted them to stay in the country. “It’s not Christians against Muslims there, but Christians against extremists,” said Bishop Dubost, while Mgr Gollnisch said Iraqi Christians urgently needed humanitarian aid. “We also have to rally public opinion and international agencies,” said Mgr Gollnisch, adding that the refugees should write the history of their community, so the Islamists could not later claim there had not been any expulsion from Mosul. Top: Protestors in Detroit this week called on the Government of President Barack Obama to act to protect Iraqi Christians. Photo: CNS/The Michigan Catholic. Above: Cardinal Barbarin addresses journalists on return from his trip to Kurdistan. Photo: Reuters.